A car inverter transforms the Direct-Current electricity that you find in cars into the higher voltage Alternating-Current electricity that you normally find in homes. This enables you to plug home appliances into the inverter wherever you are and have them powered by your car. This is the magic of the car inverter. 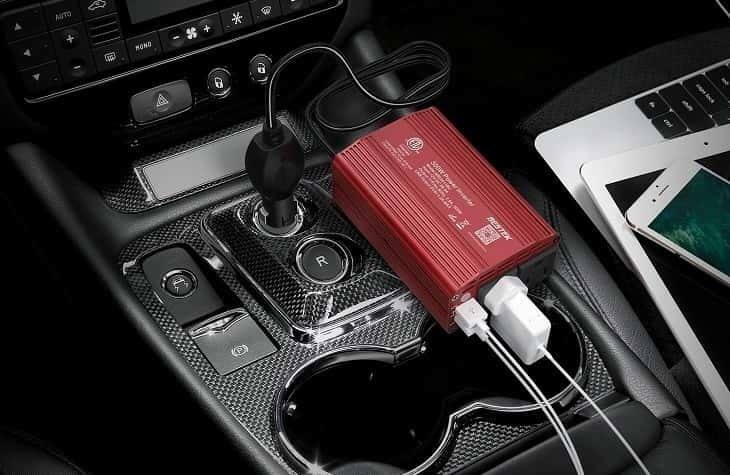 For most users, having a car inverter makes the charging of phones and laptops easy while on the road. Others use it for family entertainment as well on the road, like playing DVDs and for powering kitchen appliances. In this best car inverters review, you'll get all the information you need to make the right inverter choice, plus you get a list of the top car inverters in the market, as well. This 150-Watt Foval inverter is perfect for anyone who just needs a compact car inverter to run and charge everyday appliances. It produces 150 Watts at most, so it's not heavy-duty. However, you can use it to charge up to two mobile phones at once, as well as run most basic appliances like a breast pump, a game console, DVD player, and the likes. It comes with multiple safety protections like over-voltage, short-circuit, over-charge, low-load, over-load, and over-heating protections. This makes it a reliable piece of equipment that you can count on for a long time to come and a great inverter, overall. 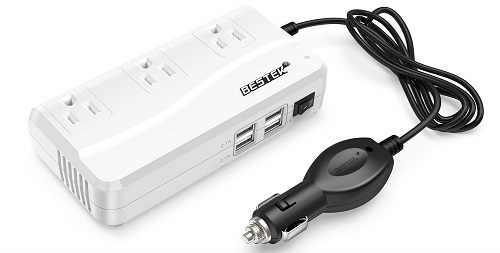 Here's another top-rated car inverter, and this time, it offers two AC outlets, allowing you to plug up to two appliances at a go. There are two USB ports as well, so you can charge your smartphones and other gadgets on the go. The USB ports are high-powered 2.4-Amp ports, designed for fast charging of compatible devices. This unit comes with a 40-amp fuse and provides other safety options like overheating, over-charging and short-circuit protections. Another feature is the housing color, which you can get in either Red, Blue, or Grey. It comes with only a cigarette lighter cable, but this is understandable since its top output is 300 Watts. Bestek backs it with an 18-month warranty. 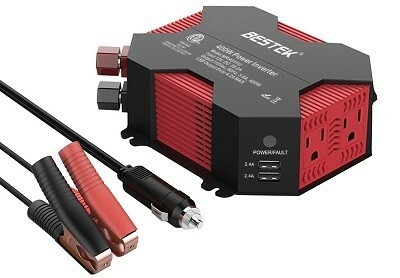 The Bestek 400-Watt car inverter is a uniquely designed device, which offers lots of features and is worth its price. Its 8-sided design is reminiscent of the X-box but in a smaller package. It offers a total of four USB ports, including 2.4-Amp ports, with two on each side of the front panel. In the rear, you get the power terminals, the fuses, and a cooling fan. The two AC sockets are on the front side of the device and together, they allow you to run as many appliances as 400 Watts can handle. All the standard circuit and voltage protection functions are also included. 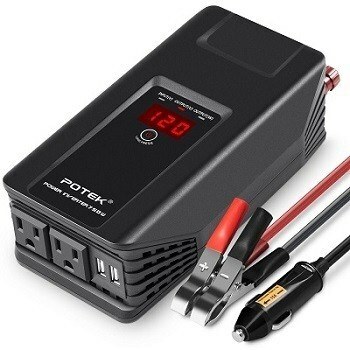 Unlike the previous inverters in this review though, this one comes with both a cigarette lighter and a battery clip cable, and Bestek backs it with an 18-month warranty. Krieger brings lots of power here with its range of car power inverters, starting from this 1,100-Watt model with a dual AC outlet and LCD display. It also offers a dual USB output for charging your mobile devices and the package includes an installation kit, plus a wired remote system for On and Off control. There are all kinds of protections built into this inverter, and it's guaranteed to safely power your vacuums, blenders, and power-hungry power tools. Other models in this series include the 1,500-Watt up to 4,000-Watt models. Krieger also includes a 3-year warranty in the package, plus an in-line fuse and user manual. 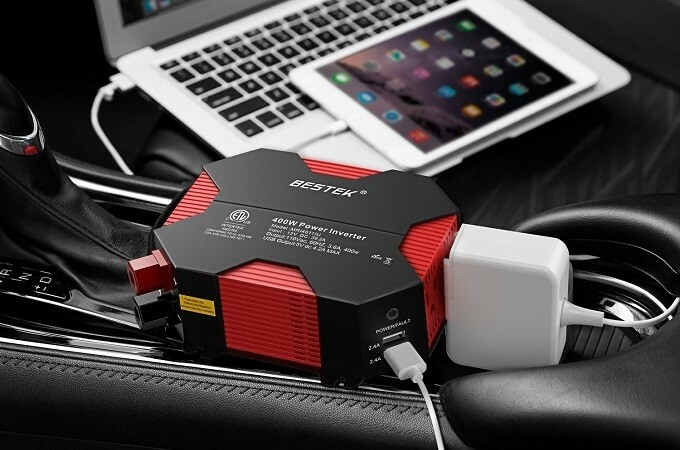 The Bestek brand is known as a maker of the best automobile inverters and this one is no different. Though it comes with a 200-Watt power rating, it does offer many interesting advantages. The first plus on this inverter is its sleek design. You can integrate it into many settings and it will fit in perfectly, such as fixing it permanently in your camper or on a shelf. Another plus is its generosity with three widely-spaced AC outlets and four USB ports, which include 1-Amp and 2.1-Amp ports for fast charging of devices. It comes with a cigarette lighter adapter for easy setup, and a 2.5-ft cable allows it for easy backseat use. There are also anti-slip rubber feet and Bestek backs it with an 18-month warranty. How about an inverter that's great for charging small devices like phones and tablets, but can also provide enough power to run small power tools? 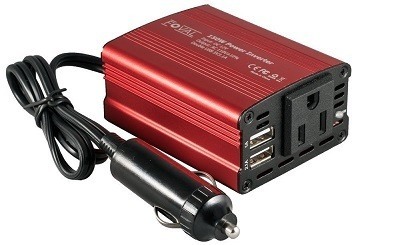 What makes this offer one of the best car inverters, is its complete package, which includes both battery clip cables and a cigarette plug cable to allow the user more freedom. It's recommended to use the cigarette lighter plug when using 150 Watts or less and to use the battery clips for more power intensive applications. One downside is that its design lacks style, but it does include an ingenious On/Off button, a digital display, a smart cooling fan, and an 18-month warranty from the manufacturer. 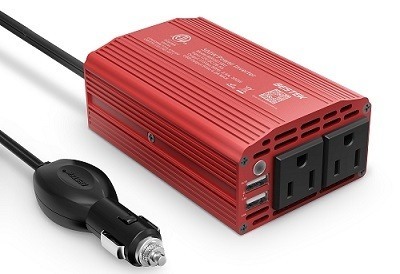 It's safe to assume that the best power inverter for cars should include some out of the box thinking, and that's exactly what you're seeing here. Many car inverter users like to recharge their gadgets or power up some devices while on the road, so a safe location for the inverter often becomes an issue. To solve this issue, Tripp Lite came up with this design that fits beautifully into your car's cup holder, so you can focus on your driving with complete peace of mind. It offers two AC sockets and two USB ports, plus it comes with a cigarette lighter plug for easy setup, and Tripp Lite backs it with a 1-year warranty. 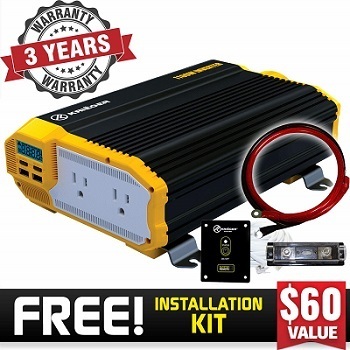 The Wagan 3722 SlimLine is the perfect inverter for any place that you need to turn your car's DC power into some serious AC power to run everything from blenders to computers, microwaves, and power tools. 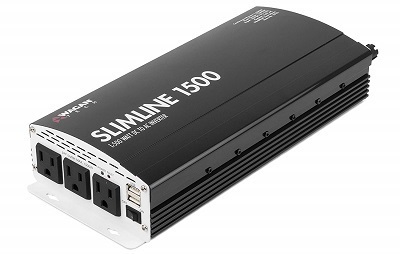 It offers 1,500 Watts of continuous power, plus up to 3,500 Watts of peak power. Two included fans keep things cool and under control, while other safety functions help to prolong the inverter's lifespan. You can also decide to mount the inverter permanently, using the built-in mount points. It features strong metallic housing and the package includes battery cables. Although this inverter is quite highly priced, it's important to note that it only produces a modified sine wave and not a pure sine wave. It's still a great buy though and Wagan additionally backs it with a 2-year warranty. Some people don't know it, but most of the affordable inverters produce modified sine waves, which can damage certain sensitive devices. 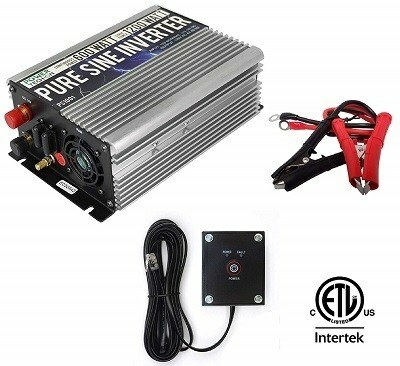 For those who need a pure sine wave inverter, this offer is exactly for you. 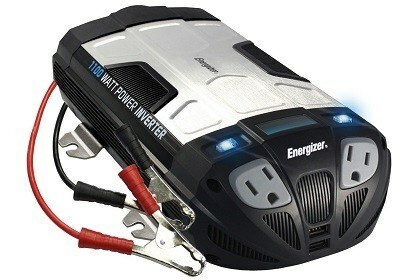 It produces 600 Watts continuous power, with 1,200-Watt peak power. 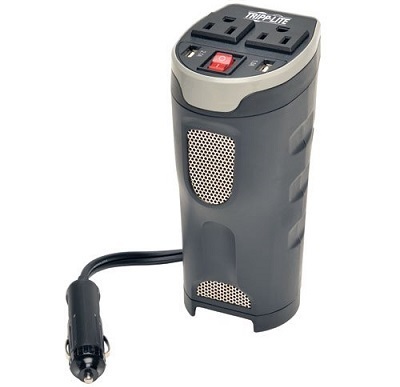 The package comes with battery clip cables and a remote system for On/Off switching of the inverter. Also, inside the inverter are all the safety components for overload protection, over-voltage protection, and the rest. Unlike most other inverters, however, this one comes with a single USB port, but it offers two AC outlets. It's backed by a 1-year warranty. This Energizer offer gets extra points for looking so modern and trendy. It's very nicely styled and will easily fit into most DIY project designs. You get an LCD display of voltage, wattage, and battery level. You also get two AC outlets, two USB charging ports, and 3-ft. long battery clip cables. If you happen to love this inverter but want a different power output, you can opt for any of the other versions, like the 500-watt, the 900-Watt, the 2,000-Watt, and even the 4,000-Watt versions. Car inverters are unique devices with distinctive technologies, making it necessary that you learn at least, a little about them, so you can understand their different features and what these actually mean. It's this understanding that'll offer you enough information to make an informed decision when choosing an inverter for your car. Following is a listing of these important factors. This refers to the total amount of power that the inverter can deliver, and from this figure, you'll also know the types of devices and how many of them that it can power at a time. To get the best car inverter with the right output power requires that you think about your purpose for the inverter first because it's easy to calculate the total power consumption of all the devices that you'll be using. Just look behind them and you'll see the watts figure. You may also want to add an extra 20% or more of power to the figure that you calculated because you never know when you might need more power. Another very important consideration is 'starting power', which is the amount of power that devices with induction motors need only when starting. This is often many times more power than what they need to run continuously. If you have such devices, then it's important that you consider a larger inverter. These devices include fans, fridges, and air conditioners. Outlets are another important deciding factor. You want an inverter that offers you as many options as possible, and this usually means multiple outlets. Most car inverters out there will offer you two or more AC outlets, which is great, although some will only offer a single AC outlet. Another feature is USB ports. Some inverters offer USB ports for charging mobile devices and other similar items, although USB is D/C power and doesn't need an inverter to produce from a car. Some car inverters work from cigarette lighters, while others need a direct connection to the battery or the fuse box. Yet, there are those that come with more than a pair of cables, so you can either attach them to the battery or the cigarette lighter, as is necessary. The choice here is left for you to make based on your power needs and availability. If you need about 100-300 Watts of power, then most cars will do okay and most cigarette lighter sockets can deliver the power. Check with your vehicle first though, because many cigarette adapters get fused at 10 Amps, which means they will deliver a top power of 120 Watts. Even with a 20-Amp fuse, you'll get about 240 Watts of power. This means that you need a real wire connection to the fuse box or battery for higher powered uses, and even then, you still need to make sure that your vehicle's alternator can deliver the needed level of power, else you'll be draining your battery really fast. You need an inverter housing that's well made to protect the components inside, so they can last longer. This may mean focusing only on inverters with steel construction. For the connection cables, you want them as thick as possible, because the thicker they are, the more power they can handle, and the longer they'll last. Obviously, you want an inverter that's easy to set up and to use when you want. A simple design with a clean interface is best, and it should come with everything you need for a quick setup. Inverters work with dangerous voltage levels and often heat up during operation. It's, therefore, necessary that a good device comes with important safety features to keep itself and its users safe. Such features include a fan for cooling the components, an LCD monitor for displaying warnings, or surge and short-circuit protection. You want the best value for your money, so you need a good product that will serve you well. One way to check out a product's quality is to check out its warranty. In simple terms, you want a car inverter with a warranty that's as long as possible. We've come to the end of this car inverters review and you've seen all the different and impressive offers in the market, including the powerful, the nicely designed, and those with the longest warranties. Since it's impossible to have a single best car inverter because we all have different needs, it's left for you, therefore, to make your choice, based on which of these inverters best meets your needs.